Last fall we traveled to Chicago to attend a conference and decided that it only made sense to extend our trip by a couple of days so we could have some fun. 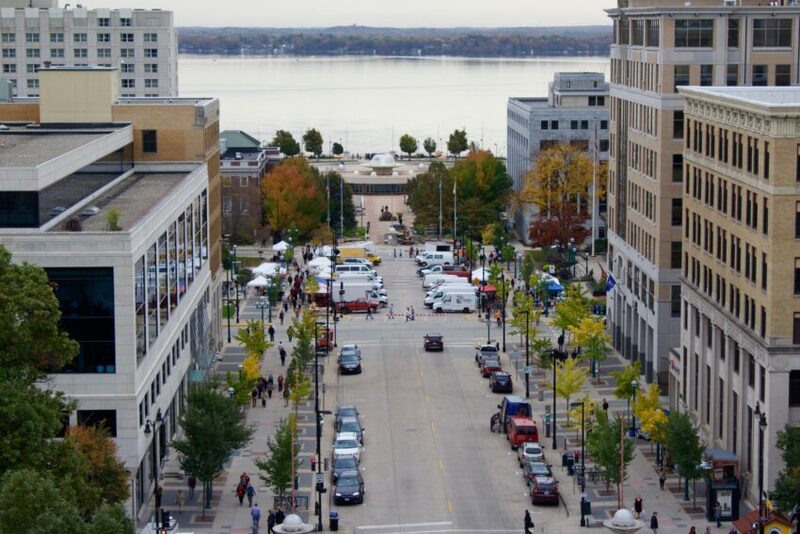 We’ve visited Madison several times really like the foodie vibe over there, so we knew it’d be the perfect place to stop and stretch our legs on the way to Chicago. We searched food tours on Trip Advisor and found one scheduled on our travel day! 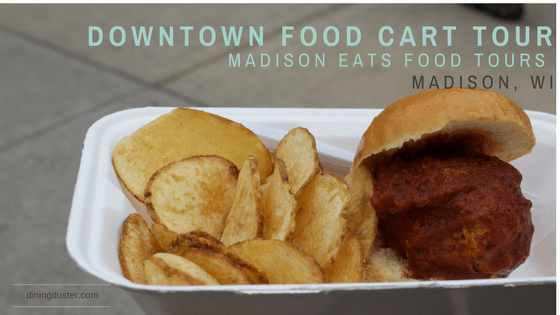 The Food Cart Tour, hosted by Madison Eats Food Tours was added to our travel agenda!! Kelly was introduced to her first Food Tour while on a trip to Seattle. 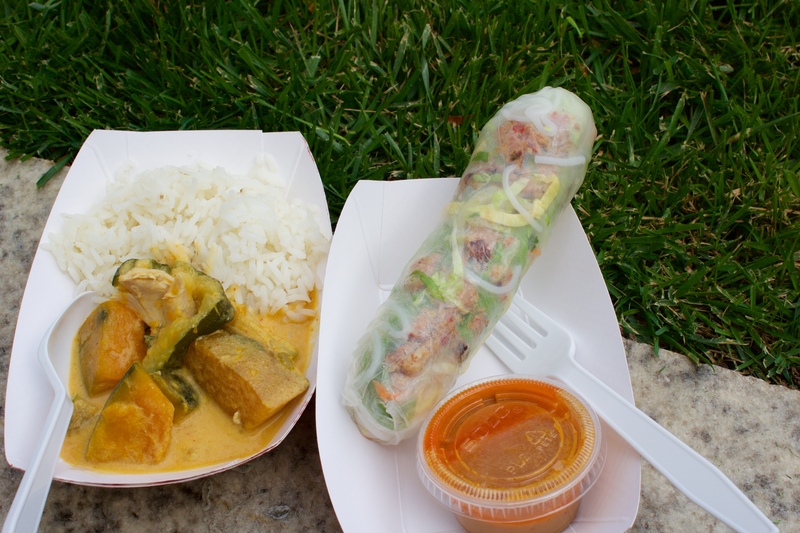 Here’s a blog post about the Pike Place Market Food Tour. That tour was a blast and we decided that Food Tours might just be our new thing. We arrived in plenty of time to find parking and walked a few short blocks to our meeting point, Starbucks, located in Capital Square, directly across from the Capital. Otehlia, the owner/operator of Madison Eats Food Tours met us promptly at our meeting spot. The really cool part is we were the only two people taking the tour- this is one of the many benefits of being able to travel on weekdays! Immediately, we felt like we had known Otehlia forever. She has the perfect personality for being food tour guide. 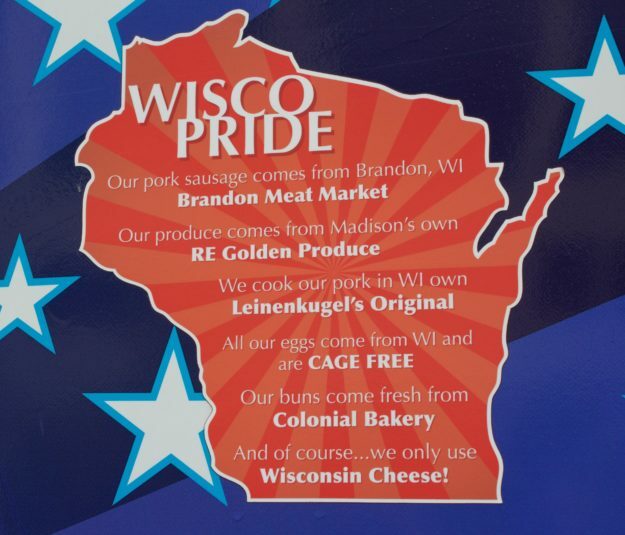 It’s obvious she loves what she does- offer food tours and show people what Madison has to offer. 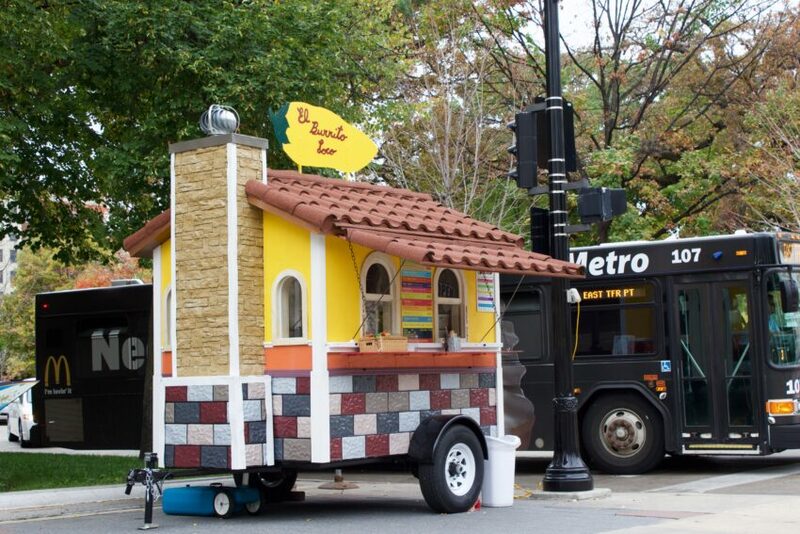 There were dozens and dozens of food carts just in the area we were sitting in! Without having taken this tour, it would have been nearly impossible to decide which to chose from- they all looked like they had something good to offer! 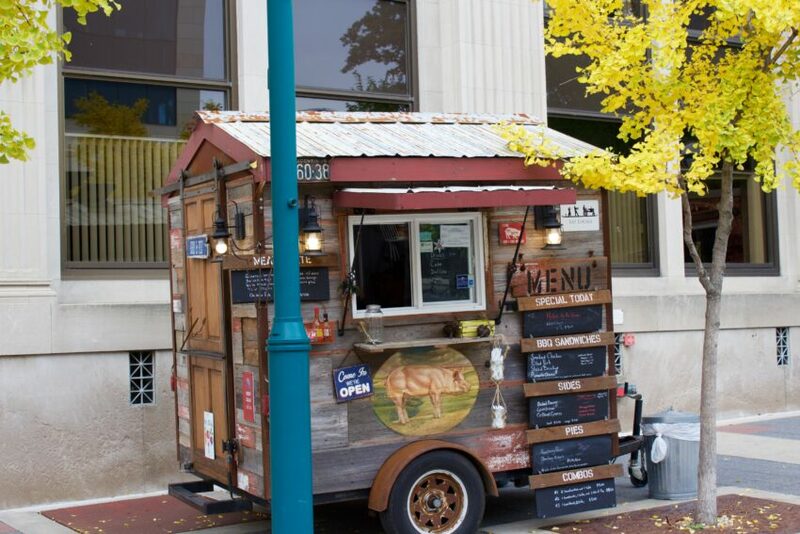 Some of food trucks were like art pieces! 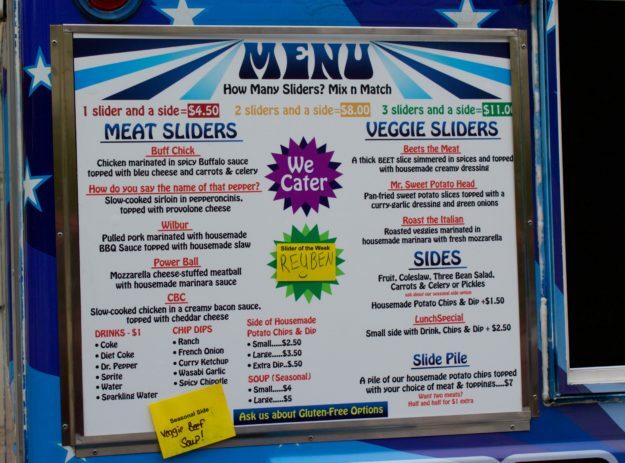 Slide Food Cart & Catering. 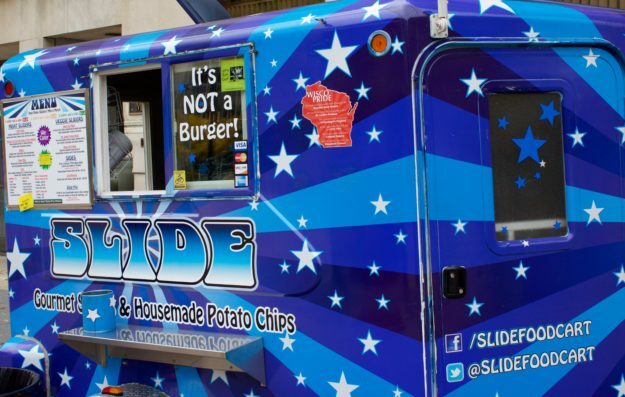 Slide has cornered the market on gourmet sliders and homemade chips. We understand why!! Otehlia told us to each select an item off the menu. We were expecting just a sample of something. It was a nice surprise to have a little meal to kick things off! 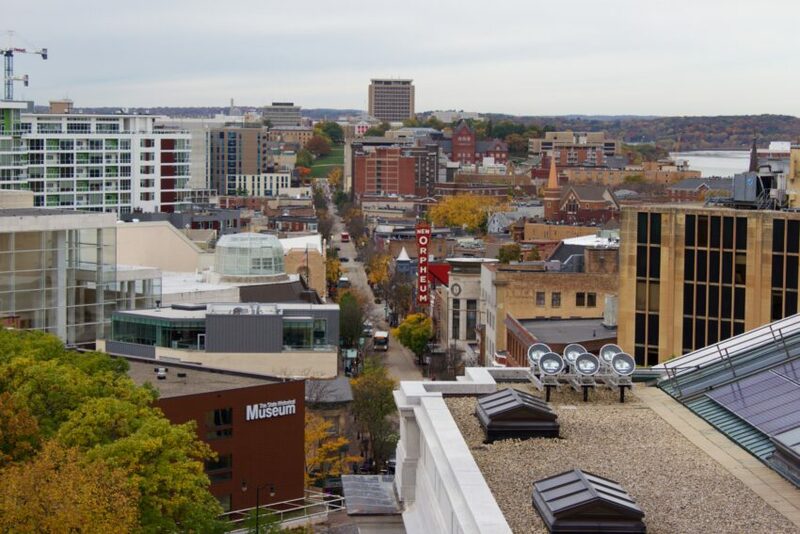 There is a trend in Madison to use locally sourced foods whenever possible. Here is how Slide implements local foods. Kelly ordered the Powerball Slider- a meatball stuffed with mozzarella cheese- how could you go wrong? It was amazing!! Dusty is a big fan of the Reuben Sandwich so the Reuben Slide was an easy choice for him to make. It met his expectations- LOL. Great flavor! We grabbed a bench while we ate and it was fun to continue people-watching and learn a bit about Madison from Otehlia. The tour of the Capital was a fun surprise and a great way to work off some of the sliders we just ate! 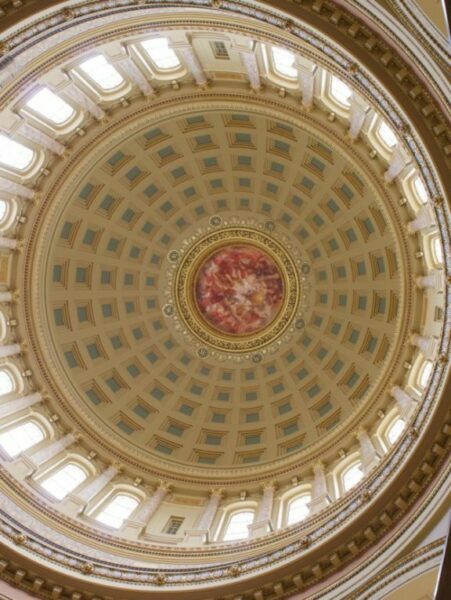 We were able to walk inside the Wisconsin State Capital and went up to the observation deck. 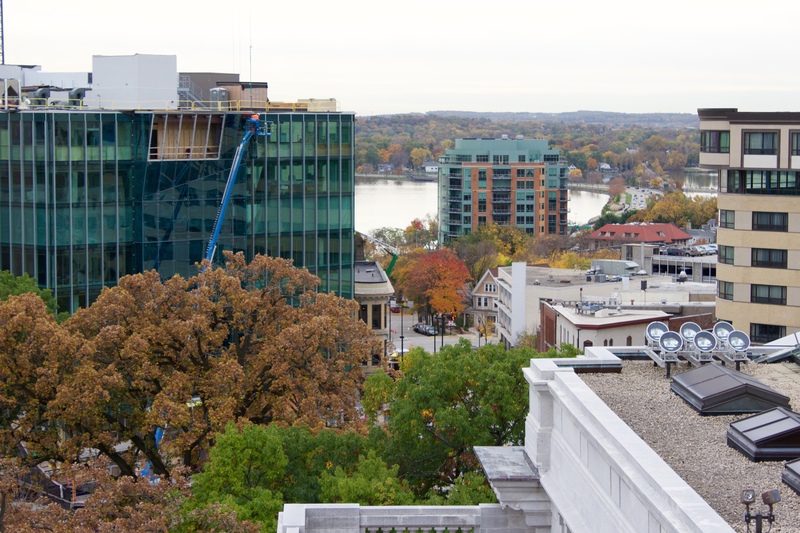 Madison is a beautiful city and was especially pretty during our October visit. 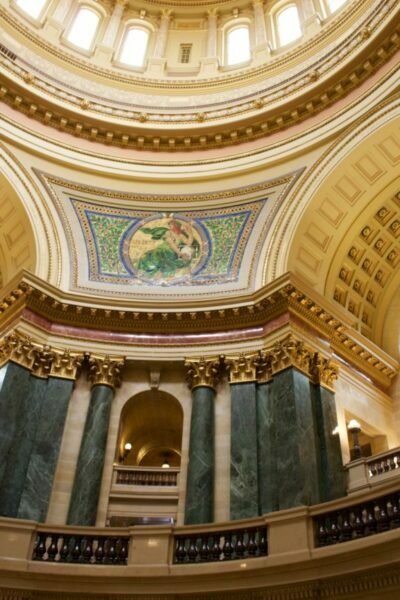 We were impressed with the easy access of the capital. The general public is welcome to enter the Capital as they wish. 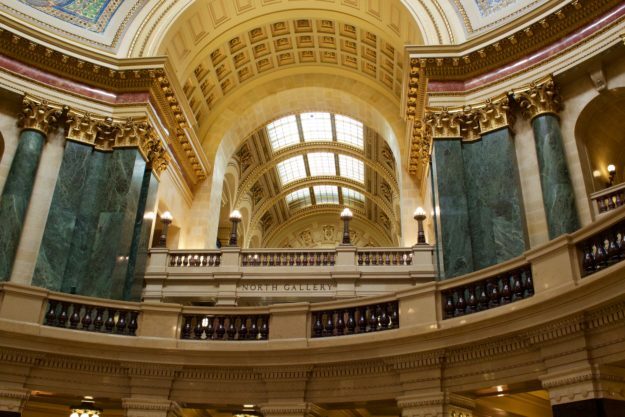 Security is present but it’s truly open to the people of Wisconsin. We took a spiral staircase to the observation deck and we had gorgeous views of the area. After the Capital we took a little walk to the Lao Laan- Xaang Food Truck. We mentioned the trend of using local foods and this cart was no different. Since it was “squash season”, Lao Laan- Xaang takes advantage and serves an amazing Curry Squash that we were able to sample. DIVINE! The curry consisted of : acorn squash, butternut squash, zucchini and thai eggplant, cooked in curry sauce with coconut milk. To compliment the Curry, we were also served a whole Fresh Spring Roll. Ingredients: lettuce, cucumber, bean sprouts, carrots, mint, parsley, somen noodles & eggs served with a peanut sauce. We ate on a bench just down from the food cart. I went back to thank Sone, the owner of the Food Cart and other restaurant locations. I also mentioned that I’ve been too intimidated to try making spring rolls at home and he said to think of it as a great opportunity to clean up your produce. He advised not to worry about technique. Simply, slice the vegetables thinly and roll them into the wraps. With time, the technique will come with practice. I made a promise to myself to attempt these at home next summer when our garden is growing. While we sat and enjoyed our curry and spring rolls, Otehlia told Dusty and I that The Lao Laan-Xaang business is family run and that Sone and his siblings learned to cook from their mother, who learned to cook for Buddhist monks in Laos- amazing! After we finished at Lau Laan-Xang we meandered down Capital Square to a tiny little corner spot facing the Capital called Teddywedgers. All they serve here are pasties. 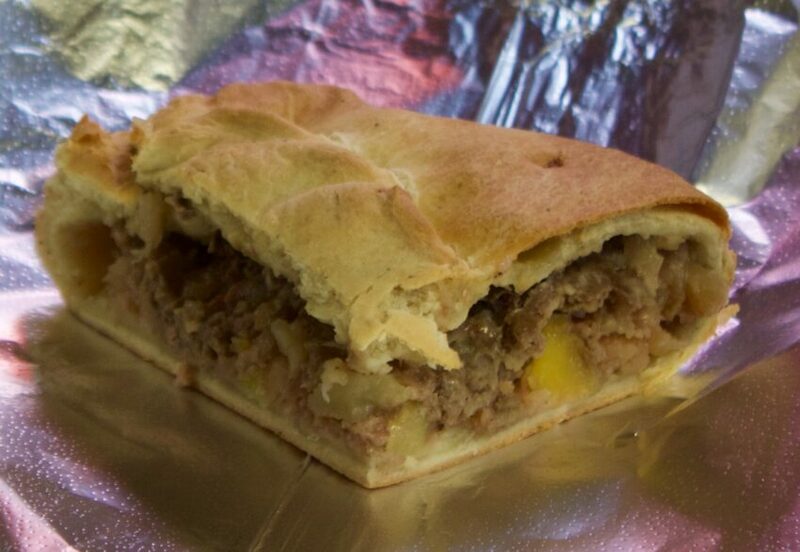 Coming from Minnesota we knew exactly what a pasty is but in case you don’t, a pasty consist of meat, potatoes and veggies baked inside a flaky dough crust. In other words, comfort food perfection. Part of the charm of this little location is that it consists of a small entry way and a cash register in front of the kitchen you’ll be taking your pasty to go if you eat here. 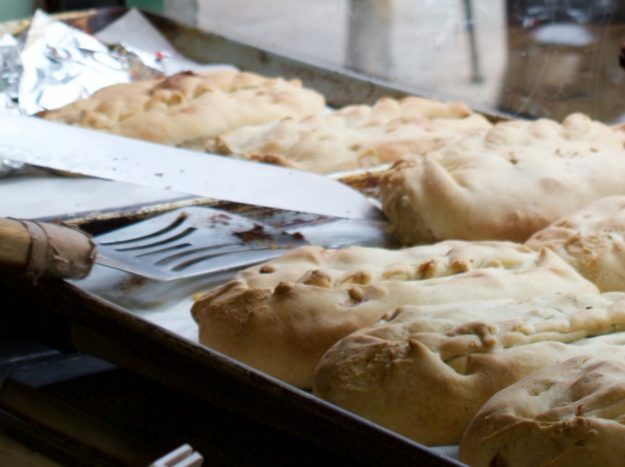 The history of pasties is that they were prepared for workers in the mines. The pastry exterior was made with a ‘handle’,making them a hearty meal that could be eaten without the use of utensils. 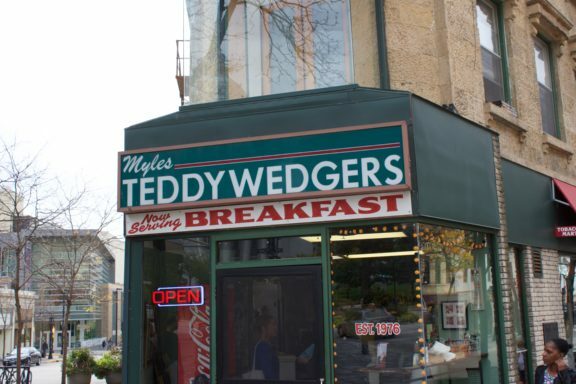 An aside… when the owner and his sister heard Teddywedgers was up for sale, they bought it rather than risk one of their favorite eating spots go out of business! They have been owner/operators ever since! After finishing our Pasty we made our way down Capital Square to DLUX for a little dessert and to finish off the tour. DLUX is another local favorite with multiple locations. The vibe in DLUX has an upscale diner feel, very comfortable and inviting. The menu looks divine and comforting. We will make a point to stop here in the future. 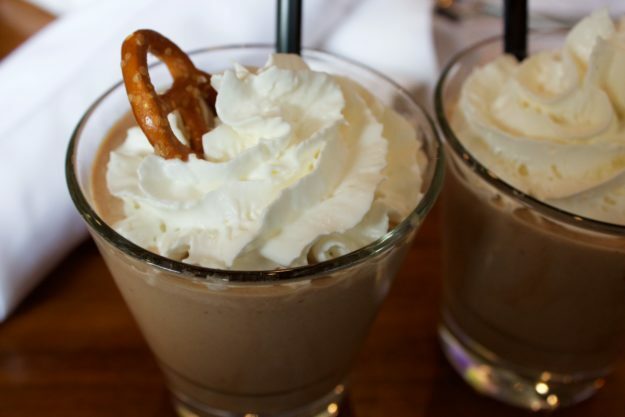 Our treat for ending the Food Cart Tour was a Chocolate Peanut Butter Pretzel Shake…..Oh my goodness! The combination of salty-sweet was going on in this shake!! Creamy ice cream with a salty pretzel with each bite. The ice cream served at DLUX is sourced from Sassy Cow Creamery, a local Wisconsin dairy farm that focuses on treating their cows with respect. It was a great way to end the tour we were able to sit there and regroup a bit and talk about all the fun foods we ate along the way. That concluded the Food Cart Tour! It was such a fun way to spend a couple of hours. We highly recommend taking a Food Tour in a city that is new to you or even one you’re quite familiar with. It’s a fun way to immerse yourself in the local culture and learn a bit about the food community! Wear your walking shoes! We walked about a mile on flat ground during our tour. It’s mostly outdoors so dress accordingly. Arrive hungry! Trust us, this might be your last meal of the day. You can book this tour here . Here is a list of all the tours.